Work vehicles and equipment enter the wash pad area and are sprayed off by a pressure washer or water cannon, rinsing off dirt, grime and grease. Angled to catch the dirty water, the catch basin is below the wash pad and leads to a water treatment recycling system. The contaminants are then separated from the water which are stored for future reuse, and the pollutants are drained into the disposal system. Alklean Industries, Inc. in Pasadena, Texas. Efficiently and effectively clean your trucks and equipment using an on-site washing wash bay. By rinsing away excess mud, oil and other contaminants, your vehicles can run better, and the equipment can function properly and last longer. Within a wash bay, there is a wash pad, a pressure washer, a catch basin, a recycling machine and a disposal system. 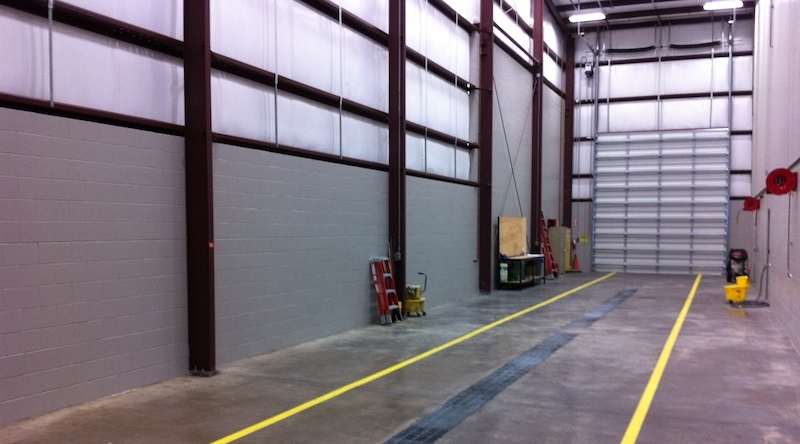 Exterior photo of a wash bay located at Southern Environmental Equipment in Leesburg, Florida. Wash bays provide the ability to clean equipment while disposing of wastewater safely. The contaminants washed off general work site equipment can have a harmful effect on the environment, but by using a wash bay, it collects the pollutants and keeps them from spreading. After the dirty water is run through the recycling system, it can be stored and re-used. 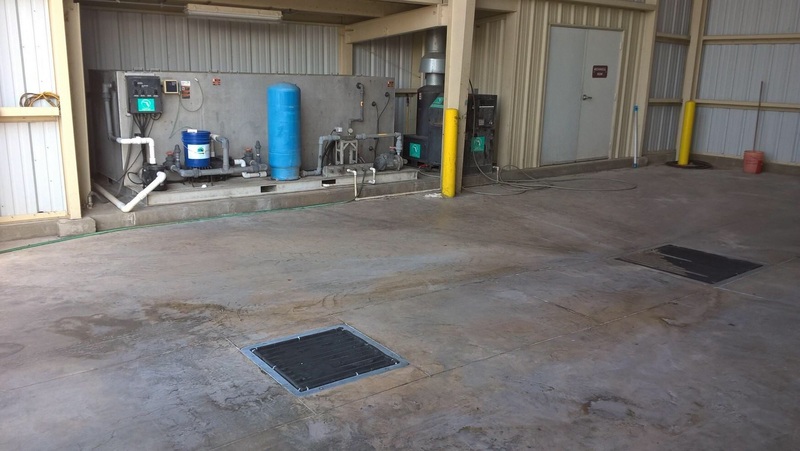 A water treatment system, catch basin and wash pad from Southern Environmental Equipment in Leesburg, Florida. Wash bays can be permanent or mobile depending on what you need it for. For sites that are temporary, a portable wash bay can help clean what you need throughout the duration of that site’s location. No matter the type of wash bay you choose, you can depend on it properly recycling dirty wash water and disposing of its contaminants. To help you decide on the specifications your wash bay will need, Mi-T-M’s dealers have the knowledge to assist you. By designing, supplying and installing your new wash bay, you can have peace of mind knowing it was completed by the experts. From start to finish, our dealers will be there to answer any questions you have along the way. From fences to decks, siding to lawn furniture, cars to garage floors; the places and things you can clean with a pressure washer are seemingly endless. So does it make more sense to rent or buy a pressure washer? If you only use a pressure washer once or twice a year, it may make more financial sense to rent a pressure washer unit. You may also wish to hire someone with their own machine to clean your home and items. What is the cost for that service? If you’re a weekend warrior and wash your house and appliances several times each year, you may want to purchase a sturdy and reliable washer. Mi-T-M offers a huge variety of residential pressure washer sizes and styles. Make sure you compare apples to apples when deciding to buy or rent a pressure washer. Once you know which motor and type of washer best fits your needs, you can calculate the hourly cost of renting vs. buying. Renting a pressure washer may cost $50-$150 dollars per day. Buying a pressure washer, depending on the model and motor, runs $300 and up. Therefore, 2-3 rentals may be the same price as buying new. When you rent a pressure washer, you don’t have to maintain the machine. However, you may have to pay for rental insurance. When you buy a pressure washer, you’ll need to pay for your own repairs, but you’ll own the machine outright. Availability is another factor. If you own your own washer, you can use it whenever and wherever you need it. However, if you wish to rent, know that there are some seasons and times of year when washers are in high demand. Renting during those times may be more difficult or may cost more. 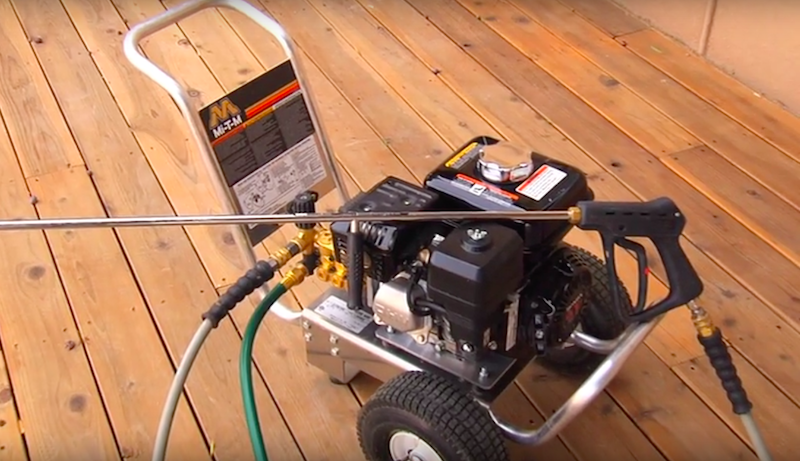 The experts at Mi-T-M can answer all your pressure washer questions. We’ve been in business for more than 40 years and our promise is to deliver unmatched performance—from the quality of our products to the dedication of each employee who does what’s right for our customer every time. 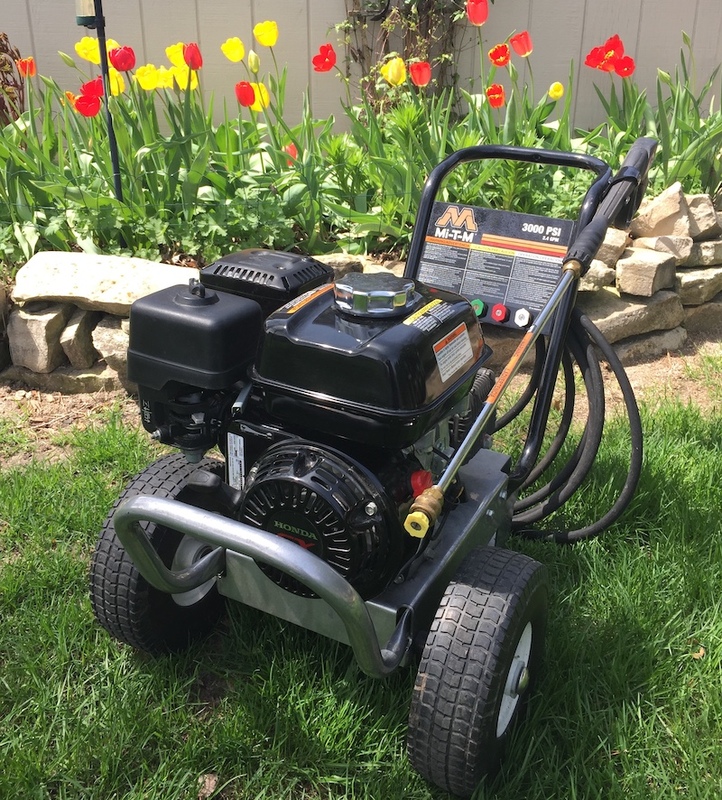 Let us explain the difference between hot and cold pressure washers, determine which size machine and motor best fits your personal needs, and help you decide if renting or buying is best for you. Call or email us today. Want to wash more while saving money? When washing the sides of large buildings, expansive parking lots and miles of sidewalk, Mi-T-M’s trailers allows efficient transportation, so more projects—big or small— can be completed in a day’s time. Don’t worry about how to get your water pressure machine to multiple locations; clean off the dirt and grime by being mobile with Mi-T-M’s customizable pressure washer trailers. Offering single and dual-axle trailer units, we have the trailers you need to conveniently transport your pressure washer. Our single-axle trailers offer three different models varying between types of brakes with one 200-gallon water tank. In addition to the single, Mi-T-M has dual-axle trailers that hold two 200-gallon water tanks and can provide you with more water for your water pressure projects. There are three different dual-axle trailer models to choose from and our experts can help you decide which is right for you. Both single and dual-axle trailers feature a swivel jack with pad, a 2-inch ball hitch and rubber mounted sealed lights. The tanks are enclosed with a powder coated steel frame, so leaks are nonexistent. To reach the tanks, the trailers are built with aluminum treadplate steps. After you decide which model you like, continue to customize your trailer by picking from an assortment of hose reels, replacement hose reel parts, backflow preventers, trailer tank bypass options and trailer hitches. You can choose what accessories you need for your trailer at Mi-T-M because we specialize in customizing trailers that work for you. “Godzilla of all trailer mounts!” – 1000gal water tank, 4-hot water pressure washers and 4- hose reels. This fantastic trailer from the experts at Chappell Supply & Equipment will be the envy of the entire oil/gas industry! Mi-T-M’s trailers are equipped with everything you’ll need to complete your washing projects. 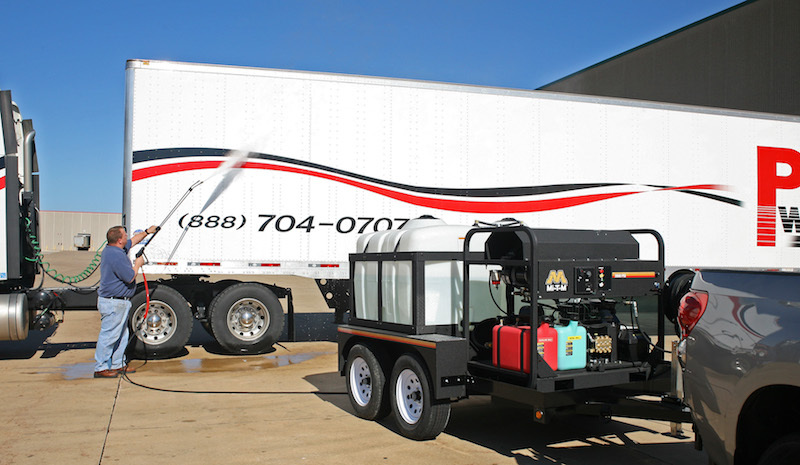 Customize your single or dual-axle trailer with a Mi-T-M hot or cold water pressure washer. excellent for cleaning a wide variety of surfaces, including siding, driveways, dog kennels, cars, boats, RV’S, and decks. capable of cutting cleaning times by 50%, which is especially useful when cleaning more than a couple hours each week. Communicate with our experts to find which trailer is most suitable for you. No matter the location or how large the project is, Mi-T-M trailers are durable and are the perfect solution for on-site cleaning.